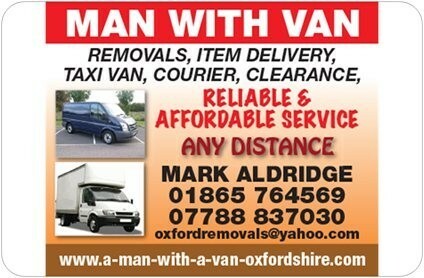 Man With A Van Oxfordshire Removals 01865 764569 or 07788 837030 mobile is a family run business specialising in competitively priced local and long distance removals, item delivery, packing and storage services, item clearances to households and businesses, professionals, students, charities, local authorities and educational institutions. Whether your move is large or small we aim to offer a professional service at a competitive price ensuring safe handling and transit of your personal effects. We have countless satisfied customers who regularly hire our services and have established a reputation for efficiency and reliability. Our vehicles include long wheelbase transit vans with passenger seats up to 3.5 tonne Luton vans for larger moves. Our experienced staff ensure that items are carefully handled and carefully transported from point of collection to the delivery address. For more information please visit the website and make an online quotation request or call Mark Aldridge on 01865 764569 .